Last week I ran a trial run of a session Don Gray and I are working on at XP Toronto. 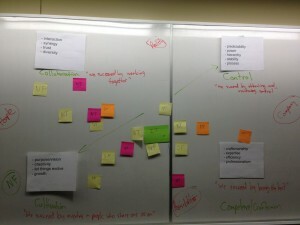 This session was a result of a session we did at AYE this year about MBTI and corporate culture. Hypothesis: Is there a way to increase the odds of a successful change by understanding your organization culture from Schneider’s culture model and how the MBTI (temperament and function pairs) of the people involved in the change fit into each of the four culture types. Brief introduction to MBTI so people can become familiar with the model. I use my type (ISTP/INTP) to describe the model. For this session we feel function pairs (how people process data and make decisions) are better suited than temperament. The four function pairs are ST, SF, NT, NF. Exercise to help people figure out their MBTI function pairing. I assumed most people wouldn’t know their type so 4 statements were given and people decided what statement most closely defined their stance. People split into 4 groups based on their function pairing and created a mission statement and described what a successful ‘agile adoption or transformation’ would look like. 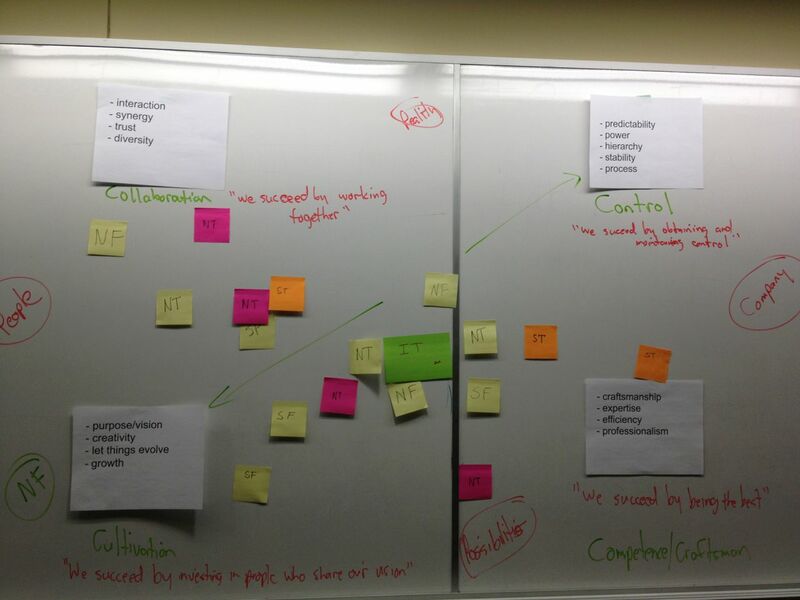 Each person wrote their function pairing on a sticky note and posted them on the Schneider culture quadrant where they felt most reflected the type of organization they would want to work in. The culture types were not given, only descriptions of them. Overall the goal of this exercise was to see how MBTI function pairings and temperament related to organizational culture. The exercises were planned to not introduce bias by giving participants the labels of the function pairs and organizational cultures. Crowd bias: given this was an XP Toronto meetup, the group agreed crowd-bias came into effect where most skewed towards Cultivation and the ‘possibility’ axis. The “NT” group didn’t finish composing their mission statement. The NT pairing is all about ideas and it’s common for lots of idea generation without a firm decision compared to other groups. The “ST” group had the least number of ideas and they were more firm and concrete. The ST group also finished all the exercises much quicker. The “ST” group debated about having highly specialized people vs more general specialists. We also mapped temperaments to the Virginia Satir change model and discussed how different temperaments are affected differently by change. SJ (sensing/judging) want to remain in the status quo to protect the group. NT’s (Intuitive/Thinking) tend to want to progress through the change as fast as possible and react with more ideas to changes that have yielded no results yet. SP’s (Sensing/Perceiving) want to move through the change as fast as possible to find the next problem to solve. NF’s (Intuitive/Feeling) want to make sure everybody is ok while the change is happening. Combining the Schneider Culture model, MBTI and Virginia Satir change model can be an effective way to create awareness around an organization and it’s people to increase the odds of a successful change. I’ve often heard the Agile community say things like “change is hard”, “culture is important” and “one-size-agile doesn’t fit all”. I think the intersection of the these models is the “why” behind those statements. I want to offer this workshop again to collect more data, if you are interested, please contact me! You said, “[this can be] an effective way to create awareness around an organization and it’s people to increase the odds of a successful change.” – I agree. This is what I’d call the radicalisation of a workforce.